A question and answer game with two special features. First, the questions are practical, not trivial. Expect many hours of enjoyable conversation about topics such as Child-rearing, Gardening, Everyday Law, Travel, Health, Cooking, Car and Home Care, etc. 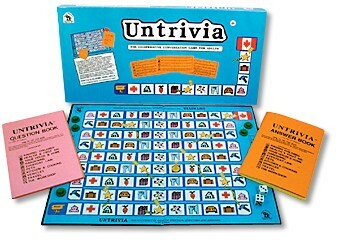 Second, Untrivia is co-operative. Players share ideas, discuss the possible answers, and decide on the best one to go for. A snakes and ladders type of board provides some pitfalls and pleasant surprises. Over 10,000 copies sold in Sweden! Includes: 13 x 18" board, thousands of questions, book with detailed answers, team mover, goof tokens, dice.